If you have a creative side, music lessons are an excellent way to hone a skill. It improves focus, expands cultural development, and provides a chance to connect with people who have a similar passion. Learning an instrument can open up doors for new opportunities. And above all, it can bring happiness to your life. Whether you want to pick up the trombone or become a master pianist, these music lessons in Michigan are some of the best. Stevensville's Southwest Michigan School of Music offers up a wide range of options for those looking to play music. Whether it's piano or guitar, bass, or even ukulele and banjo, you'll find classes for it right here. Better yet, it also offers these classes throughout the day, so if you need a particular time to fit a class in your schedule, you'll be able to do so with little incident. With free recitals twice a year and a 13-year track record backing it up, this is an excellent option for music lessons. Not many know this, but Marshall Music Co. is known as a complete music supplier, offering new and used instruments throughout the spectrum with a particular focus on high school bands. Since it supplies instruments, it's no surprise to hear they offer music lessons as well, covering that full range of instruments. With locations scattered throughout Michigan, a Marshall Music Co. outlet will be a great place to find that new instrument and learn to play it too. Strings are the thing at the Academy of Music in Grand Rapids, which is located just where the name suggests. Guitar, piano, violin, viola, cello, ukulele, and mandolin are all on tap here, and there are other lessons besides, including voice and drums. The Academy is home to the largest, and best qualified, teaching faculty in West Michigan, which is a plus by most any standard. Better still, parents can sit in on lessons or just watch from a waiting room specifically designed to be comfortable and useful. With lessons in Northville, Canton, and Plymouth, Plymouth School of Music makes its case as a dedicated facility early on. Not only is it a dedicated music school, it also makes clear what it's not, neither a “music retail store running lessons out of a back room,” nor a “dance studio adding music lessons to an already overcrowded building.” With lessons ranging from violin to guitar and beyond, a good fit will likely be found here. Have a youngster who was inspired by the Jack Black comedy classic “School of Rock”? Set them up in Michigan's very own school of rock at Milford's Michigan Rock School! Start young, too, if you're so inclined; there are programs for kids as young as four, a move which can go a long way toward helping develop focus and discipline. Summer camps for songwriters, a program devoted toward small groups, and more await you right here. Cameron's Music in Livonia represents a surprising broad set of options for those looking for more musical training. Voice lessons, brass, woodwind, strings, and percussion are all on hand here, meaning that just about any instrument on a symphonic level short of a cannon can be had. Better yet, the instructors have a rich background in music and music theory, clearly teaching what they love. It is largely impossible to discuss any sort of arts training in Michigan without talking about Interlochen Center for the Arts. Found in Interlochen, the Interlochen Center for the Arts offers a wide range of musical programs for all ages, even to the point where it offers a selectable program finder for those to input a particular specialty and the age of the person taking the lessons. Programs offered include harps, horns, and programs for children as young as third grade. Suzuki Royal Oak Institute of Music in Madison Heights offers two primary benefits to its music lessons. Using the Suzuki Method of music instruction, this organization has been operating for over 25 years now, and offers training in cello, piano, classical guitar, violin and viola. Beginner classes start as young as age three, which helps reinforce the benefits of musical training from a young age. Since new students are accepted year-round, there's always time to get that new student in. Miller Music Studio in Holt recently celebrated a major anniversary: its 35th year in operation. Yes, it's been opening and running since 1983, which is itself something of a minor miracle. 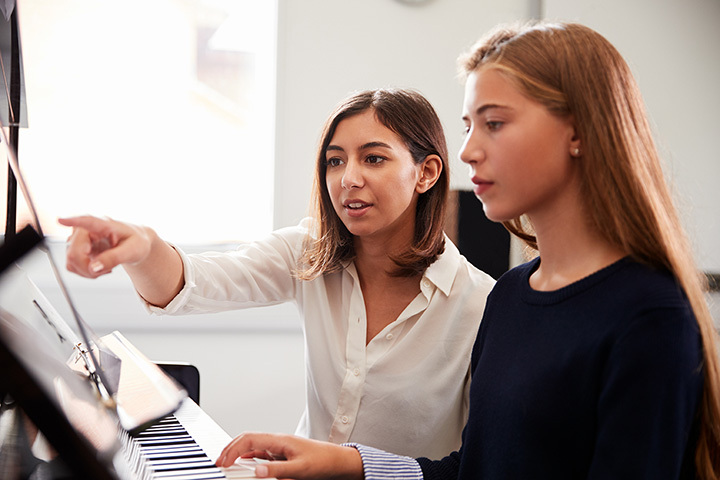 With lessons available for all ages and ability levels, and offerings running for piano, drums, guitar, voice lessons and beyond, you'll find just what you're after waiting here. Howell's Schafer's Music covers a wide range of potential instruments, including the tuba, which can be comparatively easy to learn but much harder to move. With lessons covering not only music reading but also tablature—as it's sometimes called “playing by ear”—Schafer's Music makes sure to cover the full field of potential. Since lessons run from 9 a.m. to 9 p.m., and times are available every day but Sunday, fitting a music lesson into a busy schedule becomes that much easier.